For us we have always seen bedtime routine as one of the most important stages of the day. Even with my now 5-year-old, we still have the same bedtime routine which allows her the time to relax and calm down ready for bed. So what does our bedtime routine look like? 6:15pm: we take the children up for their bath. They still bath together as they enjoy each others company at the moment. 6:30pm: we get the children out of the bath, dry them and get them ready for bed. 6:40pm: both of the children choose two stories to read and we alternate who reads to who each night to stop any sibling niggles. 7:00pm: we say goodnight to the children and tuck them up with their favourite toys before turning the lights out for bed. Even as babies, we followed this routine with both our children. We would use a nappy cream as a barrier to protect from the full night nappy, which can cause nappy rash. During the night, your child has to sleep in the same nappy for up to 12 hours so it’s really important that you help protect your baby’s skin against the causes of nappy rash when you can. Nappy rash can affect all babies for a variety of reasons but helping to prevent it is really the best way to tackle it. We would use Bepanthen at every bedtime nappy change to protect against the causes of nappy rash and it seemed to work a treat. Bepanthen has a kind-to-bums formula which is free from fragrances, preservatives, colours and antiseptics meaning you can use it at every bum change. Bepanthen’s Nappy Care Ointment forms a breathable, transparent layer to your baby’s bottom to help protect it against the causes of nappy rash. 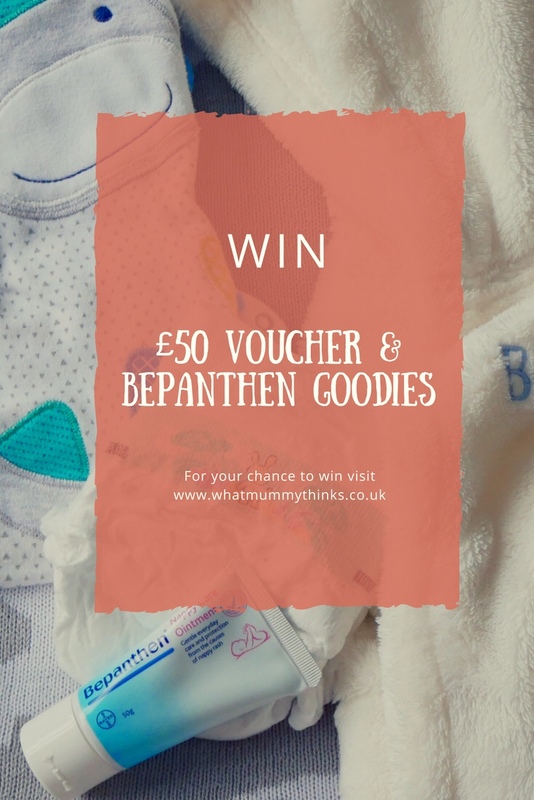 To celebrate Bepanthen’s kind-to-bums Nappy Care Ointment, we’re giving you the chance to win a £50 JoJo Maman Bebe OR John Lewis voucher (subject to availability), a 6-month supply of Bepanthen Nappy Care Ointment and a Bepanthen cuddly toy (either an elephant or a dragonfly). The giveaway is for 1 x baby bundle, consisting of a six-months supply of Bepanthen Nappy Care Ointment, a cuddly toy and a £50 JoJo Maman Bebe/John Lewis voucher voucher. The giveaway closes at 12.00am (GMT) on 29.04.18 and is open to UK entrants over the age of 18 years. The winner will be selected at random using Rafflecopter and contacted within three days of the giveaway closing. The winner has 28 days to claim their prize and provide their contact details. The prize will be sent to the winner directly from Bepanthen within ten working days of the prize being claimed by the winner. The prize is non-transferable. There is no cash alternative. The giveaway is run by What Mummy Thinks in conjunction with Bepanthen. Set up a routine and stick to it, even during weekends. Bath, warm drink, story then lights out is my routine and always at the same time each evening too. Its our special cuddle time and we have a little lullaby, my fave time of the day…. Always stick to the same routine! Try to get your child into a routine as early as possible. We had real problems with my first child and when someone suggested a fixed routine I never thought it would work, but it did on the first night! Having a few problems with my 4th at the moment now though! Have a routine and stick to it. Our routine is change into pyjamas, brush teeth, read a couple of stories and then three songs in the dark bedroom. Always try to stick to a routine and a long bath before bed definitely seems to help aswell! Stay off phone/tablet/computer etc at least 2 hours before bed time. Routine, or it all goes to hell! This has probably been said loads but honestly, just sticking to a routine. As long as you keep doing the same things in the same order, I really think your child will begin anticipating it and know what to expect which helps with their winding down. Put some lavender in a vase in their room before bedtime. Keep to a routine, warm bath, a bedtime story, .com the light, a chat about the day for a minute or two, then a cuddle and nighty night. Routine and a bedtime story! Warm milk and a cookie. No screen time at least 30 minutes before bed time. Routine, for children and adults. Quite time an hour before bedtime. We try to keep to a routine. Milk, story time, bed in a nice quiet room. a bath and story time helps wind them down – sometimes!!! My best bedtime routine tip would be to always have a routine and try to stick to it. Children find this comforting and they then know what is expected. A routine makes life easier and peaceful evenings are such a blessing – as our children got older we would stagger their bedtimes so that they each gained half-an-hour extra quiet time before bed each birthday! Routine is the key. I have little twinnies and they have been going to bed at 7pm since they were 6 months old and slept through the night. for me routine worked with my eldest too. Keep to a routine every night. Do not stray! Keeping lights dim encourages your child’s body to produce the sleep hormone, melatonin. My baby is 27 now, but I still remember those sleepless nights. She never did need much sleep, not like me, even before this pesky MS I always did love sleep. So I don’t have any tips, warm baths and stories didn’t work for my girl. Bedtime routine every night nice bath, and a warm drink. My tip is to stick to the same routine every night. Bath and a story works for us. We have a routine that carries on even on holiday, it’s always worked and never had a bad sleeper! Routine, routine and routine! That’s the only thing that worked with my daughter . A nice warm bath, followed by cuddles and a bedtime story. Try to stick to the same routine. Bath, milky drink and a story worked for us. Bath, book, cuddles and bed. Try to relax for half an hour just have a lay down or soak in the bath or read. It just stops your mind racing and helps me drift of to sleep. We always read a bed time story – here is the biggest tip – DO NOT get carried away and do big character voices whilst reading the book LOL I have done this and my little girl got too excited. Read softly and calmly. I think the most important thing is routine. At the moment, ours consists of a bath, then an episode of Mr Tumble and then a short story. It mostly works. The afternoon nap is much more of a problem though. As others have said, a routine works really well. Bath, book and bed. Routine, routine, routine. Bath before bed and a nice story. Try to keep everything calming! Routine, routine, routine! Our 14 month old knows its time for bed after his bath, when we put him in his grobag. A routine – cuddle, story, bottle! My best bedtime tip is to keep to a routine and be consistent so that children know their boundaries. This avoids children coming downstairs when they should be tucked up in bed. Keep it calm and regular is my best tip. Stick to the same routine every night and encourage quiet activities in the half hour before the routine starts. Create a routine and try to keep baby calm before bed. It’s important to establish a bedtime routine from an early age….. So bath, book,bottle, cuddle , bed! Routine is the key. A bath signals wind down time. Defo stick to a routine! Quiet & dark room works well also! Try and stay in routine…this seems to be the easiest way to make things go as smoothly as possible. We find a bath and story around the same time works wonders. Stick to a routine and use blackout curtains in summer to help block out light that might keep little ones awake. keep everything calm. soothing bath (Lavendar is great) quiet story with warm drink and then confirmation that it is now time to sleep. I spray lavender on the pillow, that relaxes naturally.